The City of Oakland is seeking input from neighbors, students, merchants, and other stakeholders along the length of Park Blvd. The roadway has a history of concerns regarding speeding and pedestrian safety. Park Blvd is also part of the City's Bicycle Master Plan, with a different recommendation for each of Park Blvd's three parts. While having one name, Park Blvd is made up of three very different segments. Below Interstate 580, Park Blvd is in a dense neighborhood close to Lake Merritt and downtown. 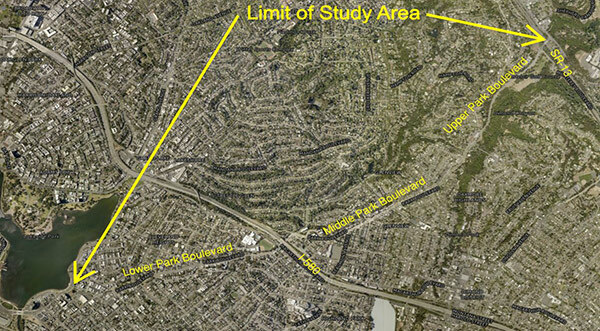 Above Interstate 580, Park Blvd is part of the Glenview with neighborhood-serving schools and a commercial district. Above Leimert Blvd, Park Blvd is along Dimond Canyon with no homes or sidewalks. See below for more information on each segment. For this study, the City's Department of Transportation is working with a consultant team primed by Michael Baker International, with support from Diablo Engineering Group, Fehr & Peers, and Spokemore Consulting. Community Process In the Fall of 2016, the City's Department of Transportation began a community outreach process to listen to community concerns, gather input and promote dialog on the following topics: motor vehicle speeding, pedestrian safety and school crossings, review of various concept plans the City has developed in recent years, road diet or lane reduction concepts, and the development of new concepts for improving the Park Blvd corridor for all users. One of the key components of the community outreach process was to address some confusion amongst stakeholders regarding whether the City was proposing a “road diet” on Park Blvd and, if so, on which of the three segments the road diet proposal would be implemented. The process was also initiated to reach a broader cross section of stakeholders, including residents of the Trestle Glen neighborhood who have expressed concerns regarding changes to Park Blvd potentially diverting motorists into their neighborhood. November 2016 Community Meetings: These meetings were listening sessions to begin the community process. There were two meetings with the same content: 11/16/16 at the Park Boulevard Presbyterian Church and on 11/17/16 at the F M Smith Recreation Center. The community process was also presented at the 12/15/16 meeting of the City's Bicyclist & Pedestrian Advisory Commission. Winter/Spring 2017 Meetings with Individual Stakeholder Groups: The purpose of each meeting was to understand in greater depth those topics/issues that are most important to each particular group. Meetings were held with the Glenview Neighborhood Association, Oakland High School (in cooperation with Bike East Bay), and the Lakeshore Homeowners Association. Lower Park Blvd - E 18th St to I-580/MacArthur Blvd Lower Park Blvd has dense residential neighborhoods in proximity to Lake Merritt and downtown. Lower Park Blvd is a City Council priority for the implementation of a road diet with bike lanes. If approved, the project would be implemented as part of an upcoming paving project. City staff is evaluating the proposed road diet and seeking input as part of the Park Blvd community process. Middle Park Blvd – I-580/MacArthur Blvd to Leimert Blvd Middle Park Blvd is the Glenview: with neighborhood-serving schools, a pedestrian-oriented commercial district, and fast-moving traffic on its way to and from Interstate 580. The common concern from the community is a need to address speeding and to improve pedestrian safety and neighborhood quality of life. However, addressing these two community concerns are in tension with Park Blvd being the only thoroughfare through this part of Oakland. What is the right balance between these competing needs? Which designs could strike that balance? Additional community discussion is needed to decide which solutions are best for the overall community. Pedestrian crossings with rectangular rapid flashing beacons (RRFBs) plus sidewalk extensions at select locations to channelize motorists, reduce vehicle speeds, and shorten crossing distances; see concept plans. Installation of up to six new traffic signals to regulate motorist speeds and create new protected crossings for pedestrians. This alternative would include the possible elimination of uncontrolled crosswalks. Conversion of Middle Park Blvd to one travel lane per direction. This alternative would include the consolidation of side street access at up to five new traffic signals. The remaining uncontrolled intersections would be limited to right turns only into and out of the side streets. In this alternative, the uncontrolled pedestrian crossings of Park Blvd are more likely to remain than if the traffic signals are installed without the conversion of travel lanes; see operations analysis. These alternatives will be refined through additional community engagement. That engagement will address tradeoffs with each alternative plus their cost and scheduling ramifications. Upper Park Blvd – Leimert Blvd to Highway 13 Upper Park Blvd is the length along Dimond Canyon from Leimert Blvd to Highway 13. For some years, the City has had a concept for building a pedestrian/bicycle path where currently there is a dirt shoulder. Can the City find grant funds to stabilize the shoulder and build the path? Or could a low-cost improvement be made by reducing the number of travel lanes to create space for the path? How can these changes improve safety and access for the Zion Lutheran Church & School?